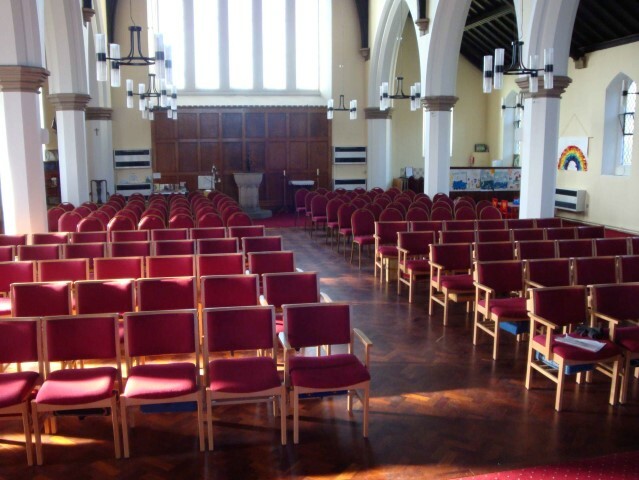 Our next General meeting will be on Thursday 2nd.May 2019 in St.Alban's Church, Forest Town, NG19 0EP. Starting at 1.45 pm. Ii is very depressing and disappointing that I must advise you that I have not to date received any indication from any of our members that they will put their name forward for the positions of Chair and Vice Chair for the next year. We have been established now for over 3 years and at present have 219 members with fifty people on our waiting list and we have established 29 interest groups. All this could be lost. I have for the last six months at meetings and in the newsletter advised you all that we need the four officers of Chair, Vice Chair, Secretary and Treasurer filled for our U3A to continue and have included brief job descriptions in the Newsletter. Sue Harkin has put her name forward to continue as Secretary and we have received a nomination for Treasurer BUT we are in a position where there is no nomination, or indeed any indication, that our members are prepared to take on either of these roles of Chair and Vice Chair. Should nominations not be received by the 6th May, (28 days before the AGM); at the AGM I would have to advise the membership that I would be calling an EGM (extraordinary general meeting), when the sole item under consideration will be the closure of the Forest Town & District U3A. Each and every member please give this matter serious consideration as to whether you can take on either of these two roles. Please advise me if you are going to put your name forward and also complete a Nomination Form which must be forwarded or handed to our Secretary. Should you need more information you can email me at mikethos42@yahoo.com or ‘phone me on 01623 470929 or 07790177224, or speak to any member of the present committee. There is a Virtual U3A website aimed at people who are housebound or cannot get to a U3A meeting for any reason. If you have a friend, relative or neighbour who would like to be part of a wider, worldwide organisation, make new friends and take part in groups and discussions online - in a virtual U3A environment - direct them to this website: Virtual U3A. 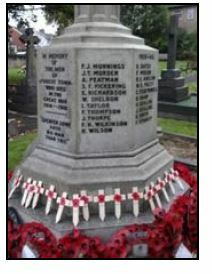 The Forest Town & District U3A April 2019 newsletter and all previous newsletters are available to read on the Newsletter page. To read the Newsletters and other .pdf documents on this website you will need Adobe Reader or Adobe Reader DC. There is a download link to the Adobe website and guidance on the Computer and IT Group pages. 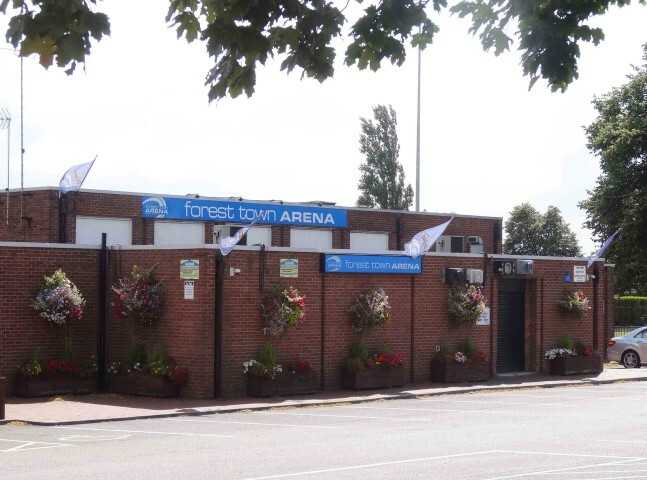 Forest Town & District U3A general meetings are held on the first Thursday of the month in St.Alban’s Church Forest Town, the meetings are open to all members and visitors, if you are a visitor sign in at the visitors’ table and one of our members will be there to help you. The meeting starts at 1.45 pm and is opened by Mike our Chairman, Mike makes the initial announcements followed by announcements from group leaders about group activities, new groups, and forthcoming events. it is then time for a free cup of tea or coffee and a biscuit served by our lovely tea ladies and an opportunity to chat to friends or speak to our group leaders and join a group or groups that interest you, following the break Mike introduces our guest speaker, we have a different speaker or event each month covering a wide range of topics. Visit the Meetings and Events page for details. The meetings usually finish around 3.30 pm. 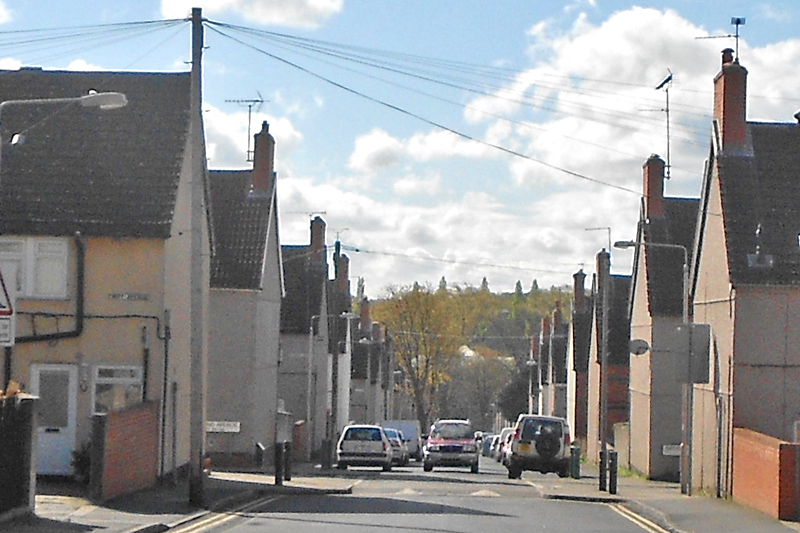 Please respect our neighbours and do not park in the residential areas of Forest Town. 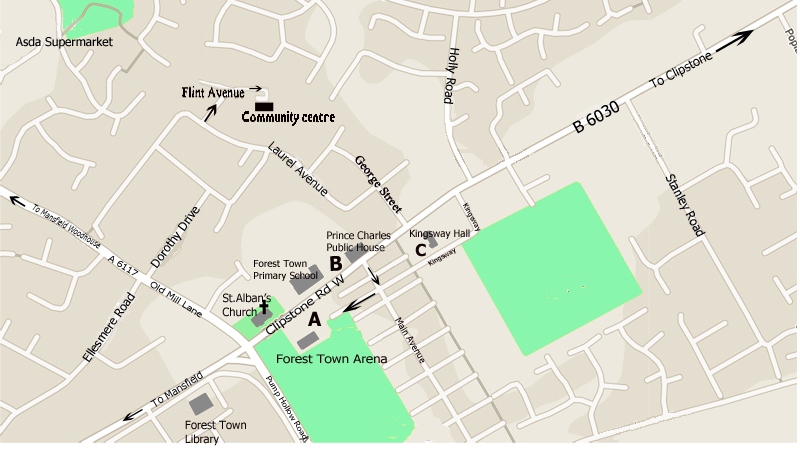 'A' Forest Town Arena, 'B' Prince Charles Public House or 'C' Kingsway Hall. There are two disabled bays at the rear of the Church. 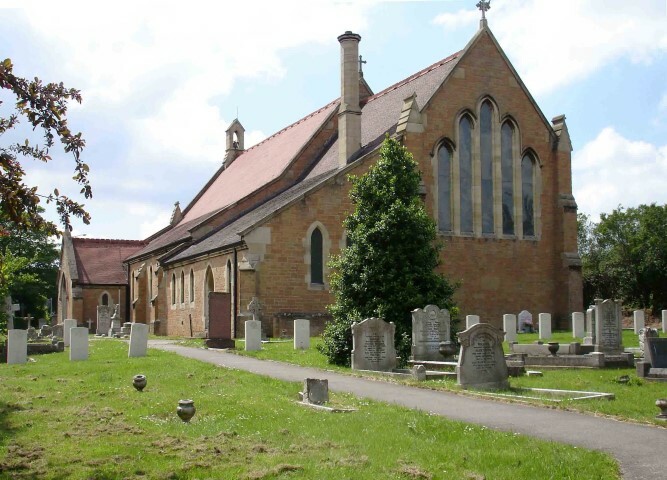 The launch of the Forest Town & District U3A (University of the Third Age) successfully took place in St. Albans Church on Thursday the 3rd of September 2015. There were approximately 130 people in attendance which far exceeded expectations and there was a buzz of excitement as the meeting voted in favour of creating a Forest Town and District U3A. The Launch meeting heard Michaela Moody, the U3A National Vice Chairman (formerly the East Midlands Regional Trustee), outline the workings of the U3A at local, county, regional and national levels. A representative of Sherwood U3A explained the development of her branch of the U3A and others locally and about the beneﬁts to be had as a member of the U3A. After the presentations volunteers came forward to form a Steering Committee to plan the activities of Forest Town & District U3A for the ﬁrst year. The inaugural meeting of the Forest Town & District U3A took place in St.Albans Church on Thursday the 1st of October 2015. The meeting was addressed by the Chairman of the Steering Committee Mike King. "The purpose of this inaugural meeting of the Forest Town and District U3A is to enrol members and to give them the opportunity to sign up for the first series of interest groups. For those of you who may be unfamiliar with the U3A, it has been said that we are “A Youth Club for Retired and Semi-retired People". The U3A provides educational opportunities for retired and semi-retired people to pursue their interests in a wide variety of activities as well as organising a monthly meeting and other events for all members. No qualifications are required to join the U3A. At this ﬁrst meeting, l encourage you to join in order for you to sign-up to the interest groups of your choice and to come to the monthly meetings. These meetings will be held in St Albans Church on the 1st Thursday of the month. Some interest groups are available to be joined today and more will be available as we progress. The interest groups, from my personal observations as a very new member of U3A, is that they are the life blood of the organisation and are greatly enjoyed by members. There is no requirement for you to have any qualiﬁcations to join the U3A or any of the groups nor do we hand out qualiﬁcations or diplomas. We all have experience of the school of life. You would be surprised by what you have learned over the years which can then be passed on to others, as indeed you will learn from them. That is what U3A is all about and you can use your experiences and knowledge to lead or help in the leading of interest groups ~ quite possibly you have an interest or hobby you would like to share with other people. Please let us know if there is any group you would like to see running and it is possible other people are interested in the same thing. All interest groups have to be self-financing so you may have to contribute a small amount towards the cost of room hire and anything else associated with the costs of that group. The U3A is the University of the Third Age. - a nationwide organisation for people who are retired or semi-retired. It is not a university in the traditional sense, members don't study for qualifications but they can join informal interest groups and share knowledge and experience. By doing this people can enjoy taking part, meeting others and making new friends. Founded in 1981, the UK U3A movement - based loosely on the French model - aims to encourage people in their third age to come together and continue their enjoyment of learning in subjects of interest to them. The 'third age' is defined by a time in your life where you have the opportunity to undertake learning for its own sake, there is no minimum age, the U3A focuses on people who are no longer in full-time employment or raising a family. Our founders envisaged a collaborative approach with peers learning from each other, the U3A movement was to be self-funded, with members not working towards qualifications but learning purely for pleasure. There would be no distinction between the learners and the teachers – everyone could take a turn at being both if they wished. From its beginnings in 1981, the movement grew very quickly and by the early 1990s, a U3A was opening every fortnight, U3As grew in Scotland, Wales and Northern Ireland and in 2008 membership was increasing by 11% every year, 2010 saw our membership hitting the quarter million mark. Today the UK U3A movement includes over 400,000 U3A members in more than 1,000 U3As and is continuing to grow every day. Two new groups are starting, see the Cryptic Crossword group page and the Off Road Cycling group page. VIRTUAL U3A ??? see this page. Andy has posted a revised Rambling programme - See the Rambling page. Notices or urgent messages can be displayed in this column or Group page, please contact the Website editor to submit your message.